If you want to keep your right to keep and bear arms, you need to contact your congressman and U.S. senators now. Amid the horror and outrage over last week’s Paris terrorist attacks, on the pretext of stopping terrorism, New York Republican Congressman Pete King is pushing a scheme to deny your Second Amendment rights—and deny your right to due process in the bargain—by banning firearm sales to anyone on the FBI’s so-called Terrorist Watch List. Just because someone who’s on the terrorist watch list does get a gun, that doesn’t mean they’re terrorists or criminals or anything else. Because you can be put on the watch list for any reason, or no reason at all. There doesn’t need to be any proof of wrongdoing. All you need to go on the list is some anonymous bureaucrat’s say-so. The government won’t tell you who’s on the lists. Or who put them on the lists. Or why. You can try to appeal after they deny you your rights. But since they won’t tell you what you’re accused of, or who’s accusing you, there’s not much way to fight back. Given this kind of power, President Barack Obama or any other government official could be able to add anyone to the list for any reason—perhaps returning veteran status, party affiliation, or even membership in an organization like the National Rifle Association—and wouldn’t be answerable to anyone for it. That’s the deadly cancer on freedom that lies at the heart of the so-called “Denying Firearms and Explosives to Dangerous Terrorists Act” (H.R. 1076). 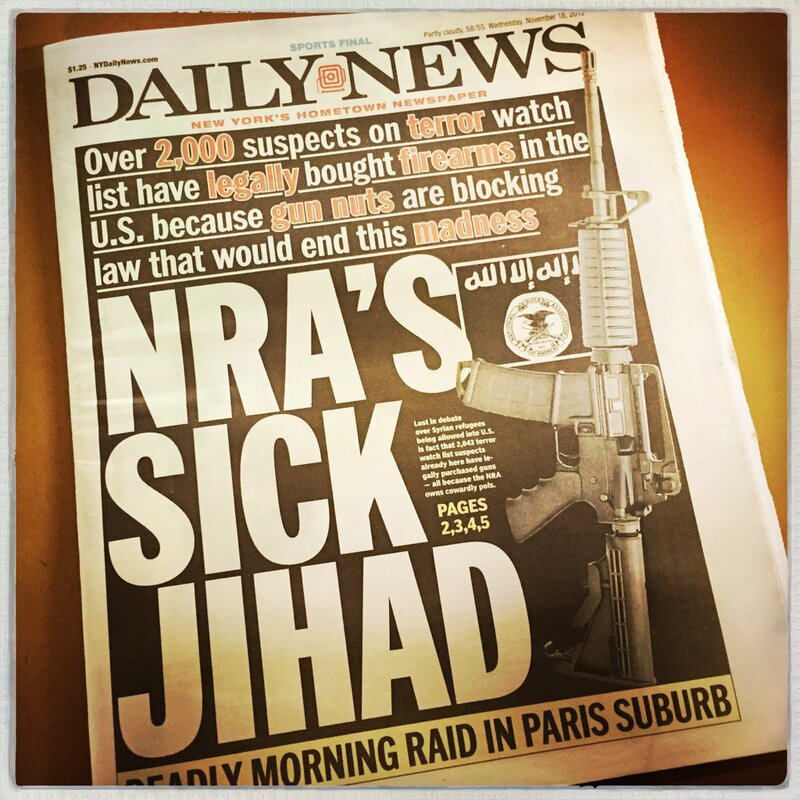 In truth, the proposal isn’t about blocking terrorists from getting firearms. The bill’s sponsors know it. It’s a cynical scheme to deny more and more Americans their Second Amendment rights, regardless of whether they’ve ever committed any crime. With Americans fearful and angry after the Paris attacks, Congressman King and his allies want you to believe that when the same thing happens here in America, God forbid, it’s because terrorists are going out to gun stores, arming themselves to the teeth, and not being stopped despite being listed in a government database of suspicious people. By Thursday, media outlets across the Internet had picked up and parroted the claims in the story with screaming, dishonest headlines of their own. The idea that terrorists get guns through legal channels, that good people should be disarmed in case they become terrorists, and that disarming lawful people for no legal reason is constitutional or even desirable is absurdly wrong on every count. First of all, terrorists aren’t getting guns on the legal market, and everybody knows it. No law is going to stop terrorists from getting guns, military materiel or God-knows-what to commit their atrocities. That’s like saying a law can keep an addict from drugs. Furthermore, despite claiming that thousands of “terrorist watch listers” supposedly bought firearms and weren’t stopped, the backers of this bill haven’t pointed to one who passed a background check, bought a gun and committed an act of terror with it. What’s more, a very high percentage of the people on the terror watch list are already barred from buying guns in the U.S. because they’re not U.S. citizens and they’re not legal residents. Fact is, this bill directly contradicts the due process protections in the Fifth and Fourteenth Amendments of the U.S. Constitution. But more importantly, it eliminates the most basic protections Americans enjoy against arbitrary abuse by an overreaching government. President Obama has fed this beast a rich diet, adding more names to the federal terrorist watch list than you can count. From 2009 to 2013, the number of names added to the list each year more than doubled. They don’t like to say how many names are on the list—the reported figures range from 700,000 to double that—but nobody really knows. Or if they do, they aren’t saying. When push comes to shove, who do you want protecting you? We believe nine out of 10 Americans will step to the side of the NRA member, and stand up for freedom. They’ll bet their lives on that freedom. And so will we. So here’s the bottom line: We will never surrender our right to defend ourselves and our families when no one else will because no one else can. And we will never be denied the most fundamental protections the Constitution guarantees to us—from our right to arms, to our right to trial by jury, our right to confront our accusers and have an open airing of any charges against us—because that’s what it means to be free. An earlier version of this story identified congressman Peter King as a Democrat. In fact, he is a Republican. We regret the error and apologize for any confusion. Contact your representatives in the U.S. House and Senate and tell them to vote NO on H.R. 1076. Tell them you oppose secret government lists that can be used to deny your right to keep and bear arms without formal charges, judgments, criminal convictions or any other legal standard. You can call (202) 224-3121, or use NRA-ILA’s “Write Your Lawmakers” tool here.